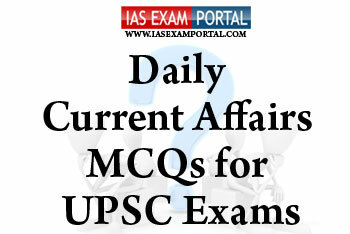 Current Affairs MCQ for UPSC Exams - 27 JANUARY 2019 | IAS EXAM PORTAL - India's Largest Community for UPSC Exam Aspirants. 1) National voter’s day is celebrated every year on January 25thas part of the SVEEP programme by the election commission of India. 2) Systematic Voter’s Education and Electoral Participation (SVEEP) was launched by Election Commission of India to inform, educate, motivate and facilitate voters and in turn make Indian democracy more participative and meaningful. 3) The SVEEP programme has been successful in increasing voter registration and high voter turnout with greater participation from youth and women. Q2. Which of the following are the main migratory species of birds spotted in India ? Q3. Which of the following statements with respect to the Insolvency & bankruptcy code (IBC) ,whose constitutional validity was upheld recently by the supreme court are true ? 1) The IBC will go a long way as a legal framework to develop the credit markets. 2) The quick reorganisation and resolution maximises the asset value of corporate debtors and promotes entrepreneurship. 3) It enhances the viability of credit in the hands of banks and other financial institutions by bringing the debtor back to the economic mainstream to repay his debt. 1) The technical textile sector is the sunshine sector forthe textile industry and it is one of the fastest growing segments of the Indian Economy. 2) They find application not only in clothing but also in areas like agriculture, medical, infrastructure, automotive, aerospace, sports, defence and packaging. 3) Technical textiles constitute nearly 50% of the total textile value chain in India, whereas in some of the European countries technical textiles constitute 15% of the total textiles value chain. Q5. India’s newly commissioned naval base INS Kohassa has been inducted into the Shibpur Naval Air Station.The unit's name has been derived from the white-bellied sea eagle, Kohassa, which is a large bird of prey endemic to the region of the base. Which of the following is the location of the newly formed naval base ?